If delicensing and other reforms of the 1990s symbolised India's decision to re-engage with its private sector, the first decade of the 2000s symbolised India's re-engagement with the world. While the policy framework adjusted quickly enough to meet the needs of changing times, where it didn't, ways were found around it. From about 30 per cent or so in 1990 to 50 per cent in 2000, the ratio of gross BOP flows (all forex coming in and going out of the country) to India's GDP shot up dramatically to over 125 per cent in 2009. While the ratio of exports-to-GDP rose to 17 per cent (imports to 26 per cent), receipts including direct investment, portfolio inflows, borrowings, remittances as well as outward investments by Indian firms made up the rest. Outward investment rose from a mere $1.6 billion in 2000 to $26.4 billion by 2007 and then fell to a mere $2.7 billion in 2009, thanks to the global crisis -- the heydays of India Inc's grand move abroad are symbolised by deals such as the $12.8 billion takeover of Corus in 2006, the $5.7 billion takeover of Novelis by Hindalco in 2007 and the $2.3 billion JLR deal by the Tatas. With a flood of foreign money pouring in to take advantage of a vastly more competitive manufacturing environment in the country -- direct investment flows rose from $2.2 billion in 1999-00 to $35.2 billion in 2008-09 and portfolio investment from $3 billion in 1999-00 to $27.3 billion in 2007-08 -- the RBI decided to dramatically liberalise the outgo of forex reserves from the country. This included liberalised spending norms for individuals and easier investment rules for India Inc. Indeed, while India continues to be non-convertible on the capital account, this is not so in practice. Click NEXT to read further. . . 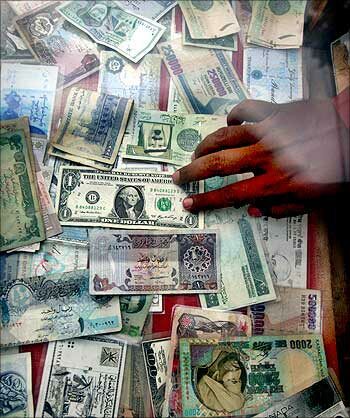 Image: The RBI has decided to dramatically liberalise the outgo of forex reserves from the country. A paper by Ila Patnaik and Ajay Shah (Why India choked when Lehman broke) argues that when the Lehman crisis broke out, Indian multinationals (defined as firms with more than 1 per cent of their assets overseas) borrowed money in India and took capital out of the country -- while portfolio investors took out just $5.8 billion in the December 2008 quarter, capital leaving India through banks and through non-bank companies totalled $10.8 billion. India's nuclear deal with the US, in a different way, symbolised this increasing confidence -- though the Left and the BJP protested the deal, more protests have been held in the country against privatisation than they have against allowing foreign inspectors to monitor nuclear power plants here. If all goes according to plan, there will be 20,000 Mw of nuclear power in the country by 2020, constituting around 8 per cent of the likely installed capacity, but the nuclear deal was not just about getting power plants. As India's export prowess grew during the decade, trade openness around doubled to around 45 per cent. Along with increased confidence, the deadlock in the multilateral trading system forced India to embark on a process of signing a large number of free trade agreements and larger economic cooperation agreements with some of its top trading partners. So, while an FTA with Sri Lanka was finalised in the 1990s, the first decade of the 2000s saw an agreement on trading in goods reached with the Asean (the one of services will soon conclude), and a beginning in one with Thailand, fairly good progress has been made on agreements with Japan, Australia-New Zealand, Malyasia, Indonesia and Bangladesh as well as with the European Union. 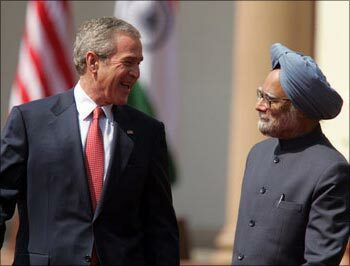 Image: Former US President George W. Bush and Prime Minister Manmohan Singh in New Delhi on March 2, 2006. SEZs were dismissed as the ultimate land grab and so they seemed when, as commerce minister, Kamal Nath proposed the policy in the last UPA government. The SEZ policy allowed a very significant part of them to be developed as commercial and residential real estate and the rush to get large numbers of them denotified once land prices began crashing in 2009 seemed to confirm the land grab thesis. Even so, exports from SEZs totalled Rs 99,688 crore (Rs 996.88 billion) in 2008-09, and as many as 318 SEZs had been notified -- ever since the SEZ Act came into force in 2005, nearly Rs 100,000 crore (Rs 1,000 billion) has been invested in them. With a very large share of SEZ exports coming out of software/hardware and 'trading and service', though, it is not clear as to whether SEZs have actually delivered on increasing exports. If FTAs, the nuclear deal, SEZs and so on were India's attempt to fashion policy to keep up with her neighbours, a large part of the UPA's efforts, both in its first avataar as well as the current one, is to extend the domestic reforms of the 1990s to the provision of services for the poor. Top on the list is the Right to Information (RTI) Act. A brainchild of UPA chairperson Sonia Gandhi, the RTI really flowed from the work of activists such as Aruna Roy who campaigned for the right to get muster roll data for various anti-poverty programmes. RTI portal rtiindia.org has already got 100,000 registered users, a sign of just how popular the RTI has become. 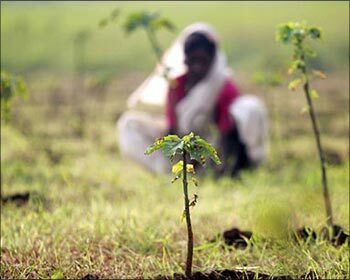 NREGA, the government's other big flagship programme derives from a successful programme in Maharashtra several decades ago but, more important, has a big IT component built into it. Image: SEZs were dismissed as the ultimate land grab. 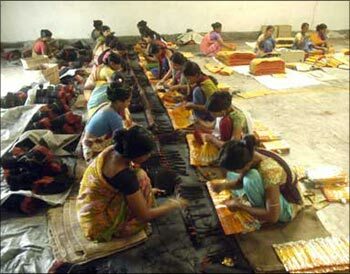 Though there are still several cases that come up of fake workers and overbilling, the way the system is designed, each project's details are available on the internet for inspection -- in some cases, like a TCS pilot in Andhra Pradesh, all payments had to be made through a post office account which increased the level of accountability. While Rs 16,000 crore (Rs 160 billion) were allocated for it in the 2008-09 budget, this rose to Rs 30,100 crore (Rs 301 billion) in the interim budget and Rs 39,100 crore (Rs 391 billion) in the final budget for 2009-10 -- not all of this, though, is additional funding and a large part has been got from pruning other social sector schemes. While NREGA is a great insurance scheme in times when there are few jobs in rural India-- part of the current food price inflation is explained by greater government spending on such programmes! -- its overall impact on jobs creation has been modest. Of the 13,500-odd crore (135 billion) person days of employment created in the country each year (45 crore (450 million) employed into 300 days per year of work), under 100 crore (1 billion) were created by the NREGA. Another grand policy which hasn't really worked well has been the Fiscal Responsibility and Budget Management (FRBM) Act. In the initial years, the government pressed the 'pause' button, then pushed back its implementation and, with increased spending on social sector schemes, the FRBM lies in tatters. Image: NREGA is a great insurance scheme for the rural poor. Ironically, this inability to meet the deficit targets took place when, thanks to better tax policies and a surge in economic growth, tax collections growth was at an all-time high. If implementing VAT was the big tax leap of this decade, the GST will be the big one in the next decade. Among ideas that have worked, Calling Party Pays (CPP) has to be pretty near the top of the list. Implemented in 2003, in order to level the playing field between the 'limited mobility' phone services of the likes of Reliance Infocomm and the GSM cellular lot, it halved mobile phone bills in a sense. Till then, users of GSM cellular phones -- this didn't apply to the 'limited mobility' mobile phones -- had to pay for incoming calls as well, so when CPP was introduced, incoming calls became free. Immediately, mobile phone growth surged and, today, around 40 per cent of Indians have phones, with 12-13 million new customers being added each month. Another good idea in principle, but extremely patchy in its implementation, has been that of Public Private Partnerships (PPP) in the infrastructure space. With India needing to increase infrastructure spending by around half more than the current 6 per cent of GDP, and the government strapped for cash, PPP was the obvious answer. Image: Calling party pays has been a good initiative. Major airports like the one in Delhi, Mumbai, Hyderabad and Bangalore have been built in this fashion, and the model is being used for road projects, metro railways and the like. A big lacunae, though, has been in the way the contracts have been fashioned, to the detriment of the paying public. Opening up of the insurance sector to private players, contrary to what some thought, didn't quite result in the state-owned players taking a beating. 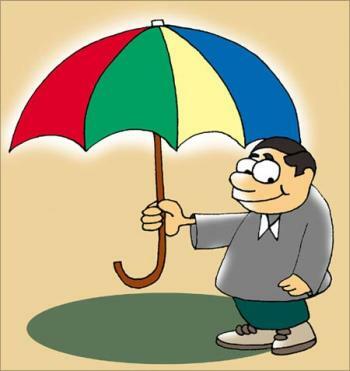 While the market size for life insurance has increased around five times in the decade to over Rs 200,000 crore (Rs 2,000 billion) in annual premium, the government-owned LIC's market share has fallen by around a fourth and is still a healthy 74 per cent. Meanwhile, however, at 4 per cent, India's insurance penetration (premium paid to GDP) was comparable to the US' 4.2 in 2007, much lower than the UK's 12.6 but higher than Australia's 3 and China's 1.8 -- in 2001, the figures were 2.1 for India, 4.4 for the US, 5.7 for Australia and 1.3 for China. In the non-life sector, the erosion has been greater and private firms have seen their market share rise from 3.6 per cent in 2001-02 to around 31.7 per cent in 2008-09. All told, the decade has had a mix of policies that have worked and those that haven't. The country's rapid growth in GDP makes it clear, even the ones that haven't worked well have not been unmitigated disasters either. Considering that all this happened when India had moved away from single-party governments, that augurs well for the future.